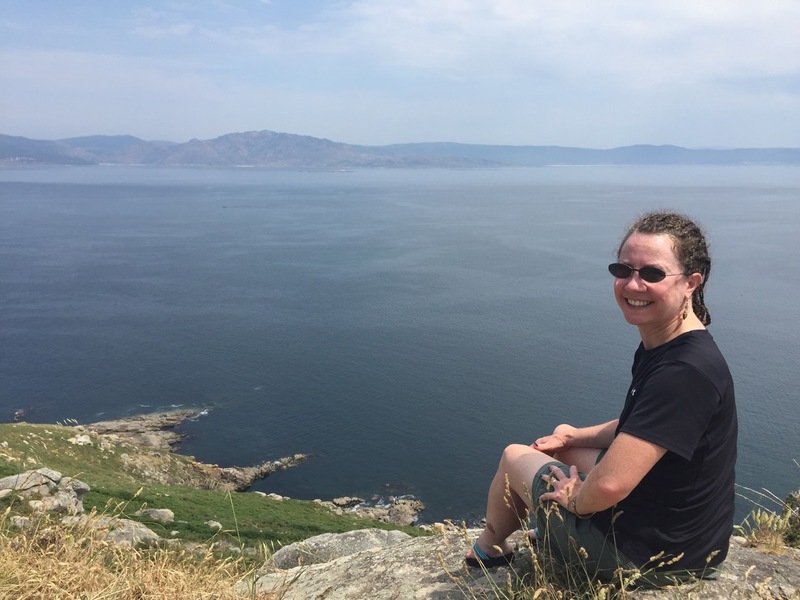 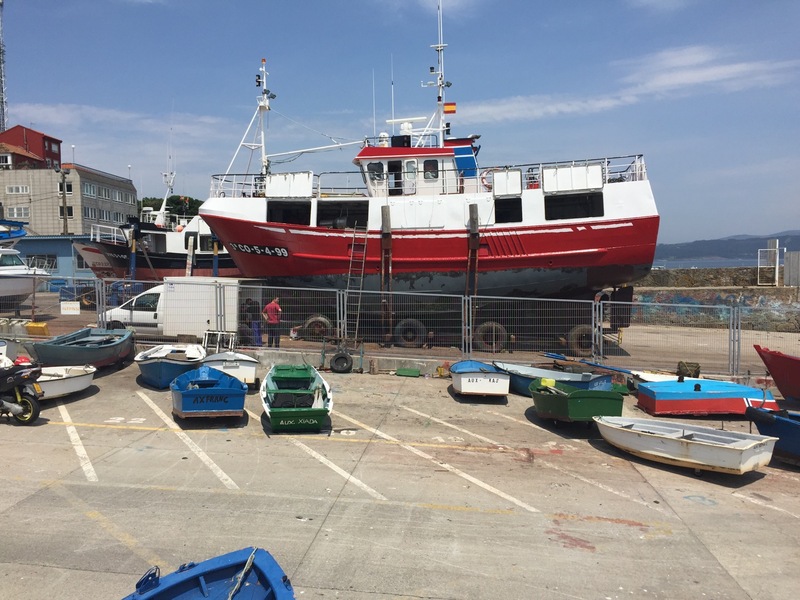 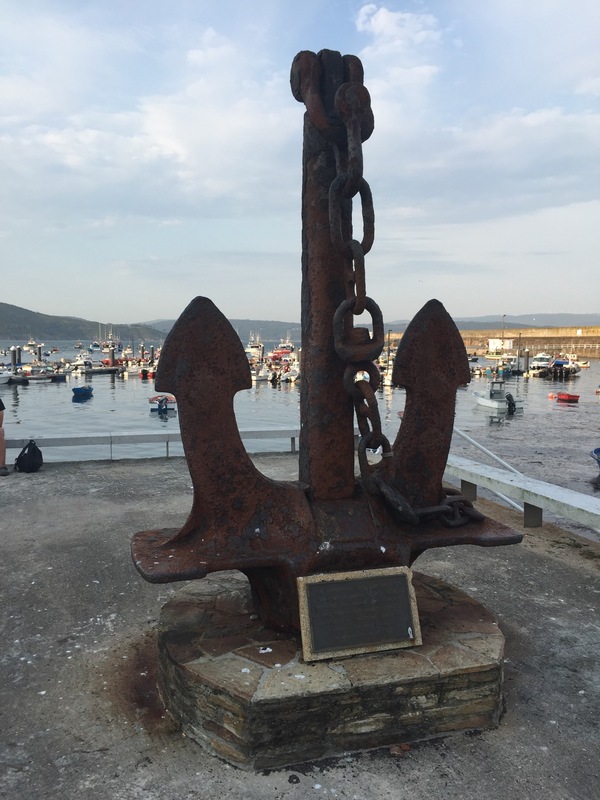 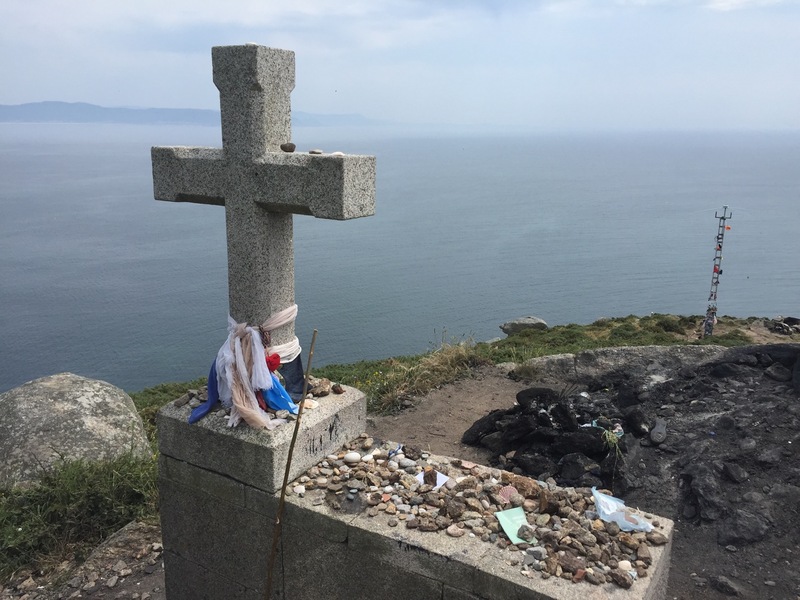 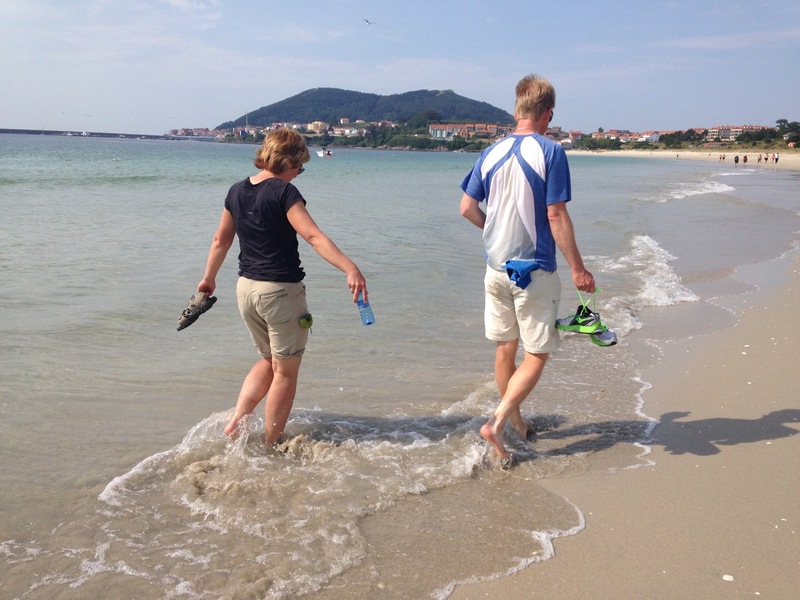 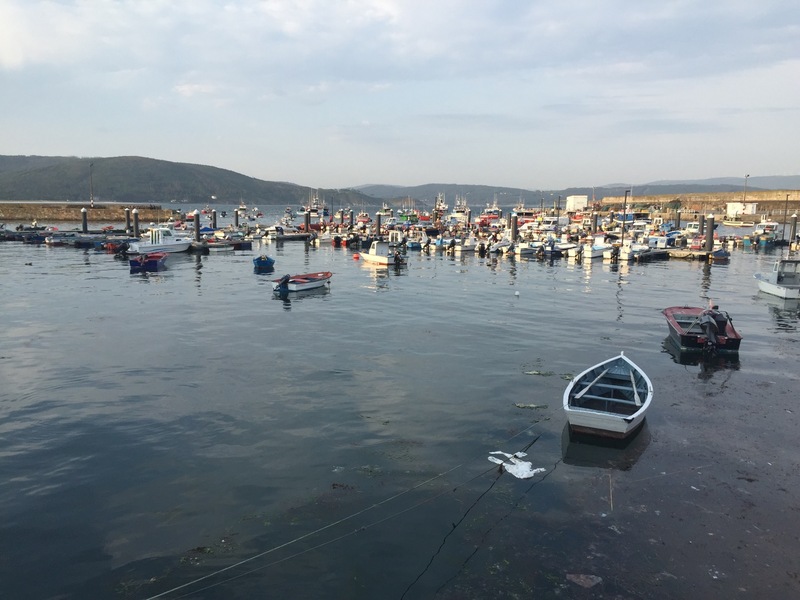 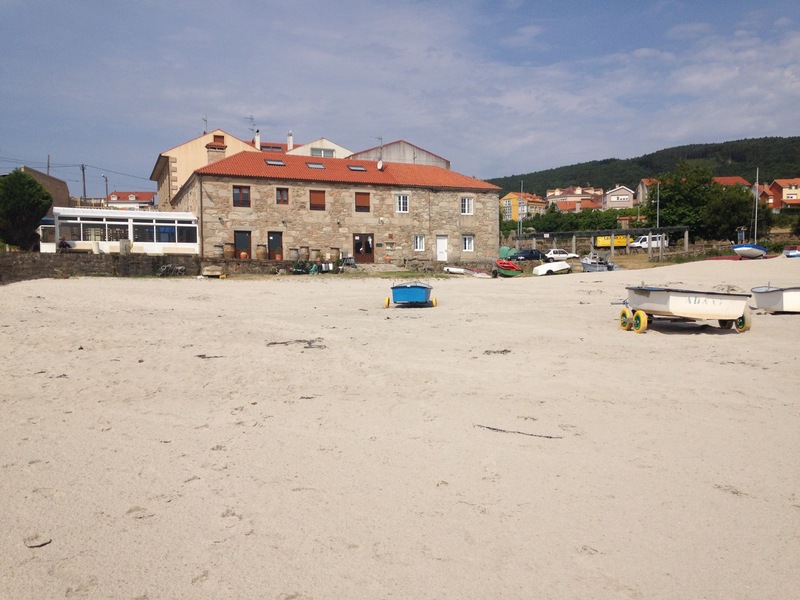 Meanwhile though, Ted and Lisa were walking to the coast at Finisterre (literal translation: End of the Earth, because they thought it was, back then) and putting in really long days getting there in three days instead of the more usual four. 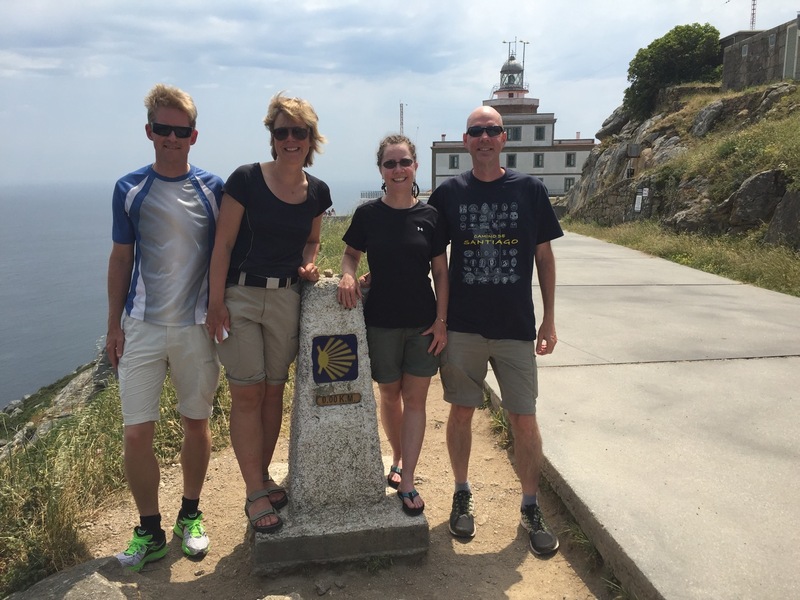 One day they walked 25 miles (41 km) in twelve hours! 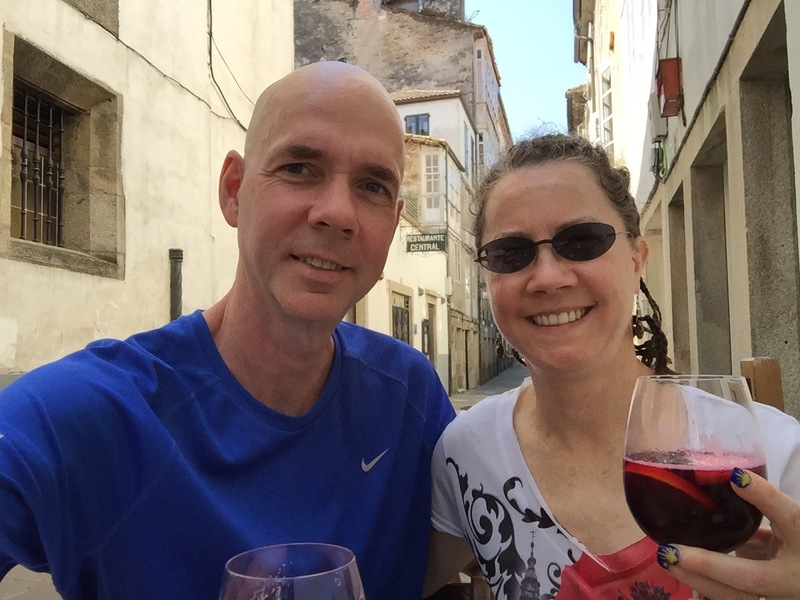 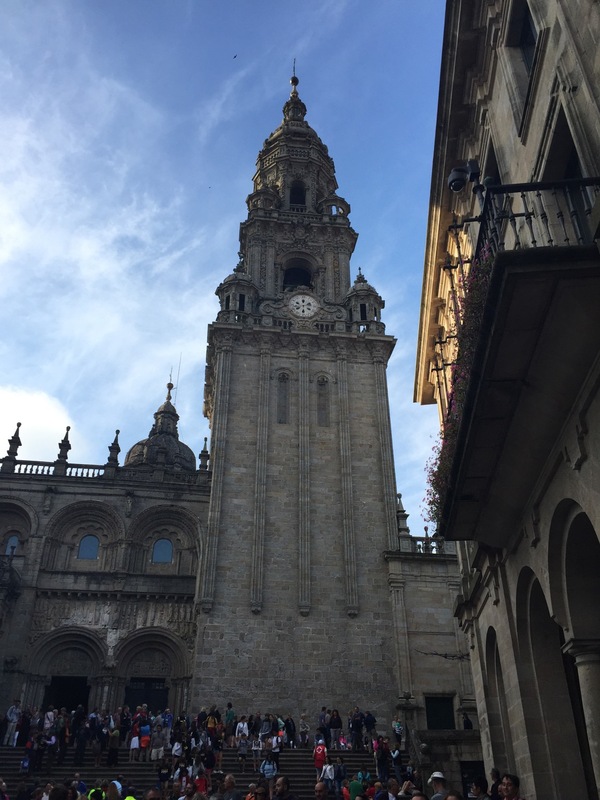 Kathey and I wandered the streets of the old part of Santiago near the cathedral, did some souvenir shopping, and ate lots of Spanish food. 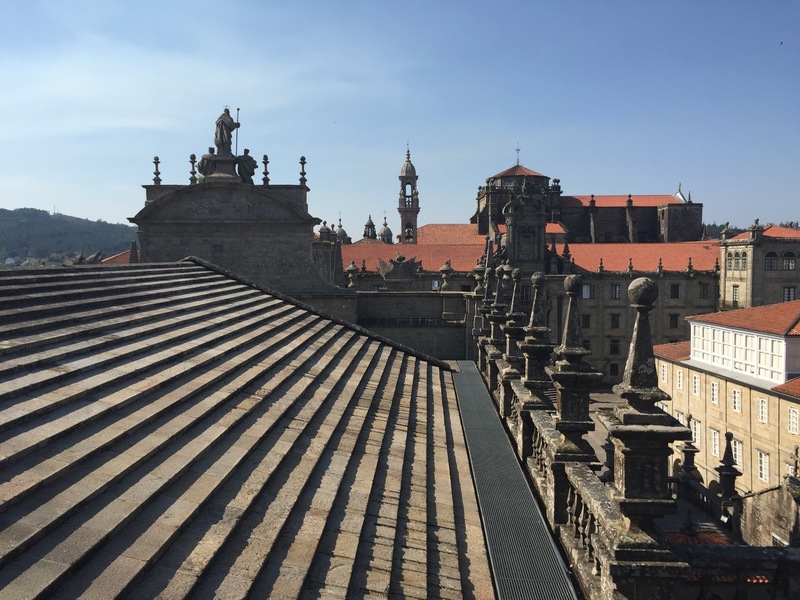 We also visited the Cathedral Museum and went on a Rooftop Tour of the cathedral, both of which we highly recommend. 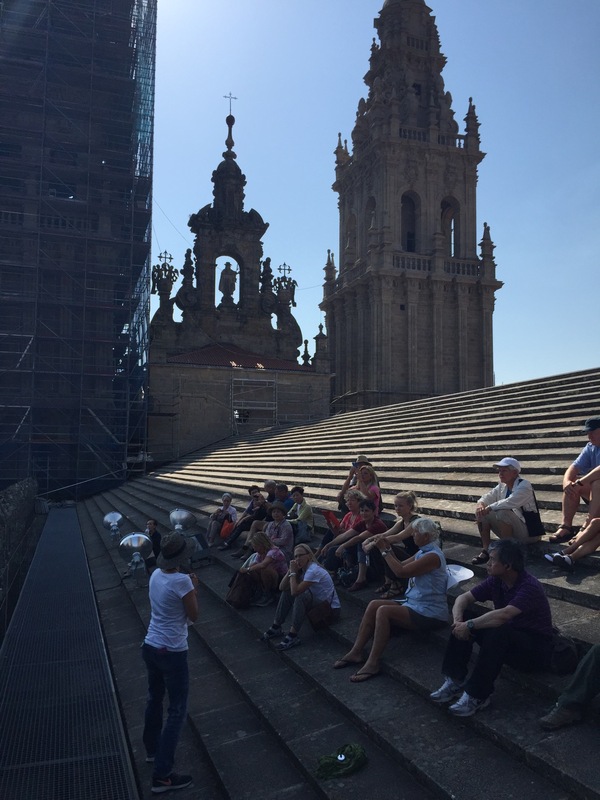 We learned a lot about how the cathedral was built and got some great views looking out over the city. 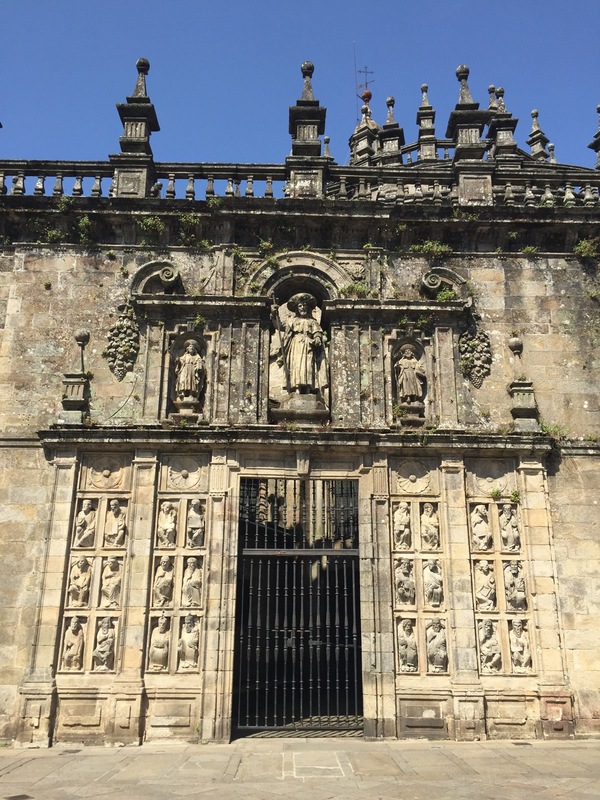 It was actually built like a castle or a fortress, complete with battlements along the top edges, and the roof was built of stone (instead of wood that could burn) in a way that allowed soldiers to walk around and stand guard. 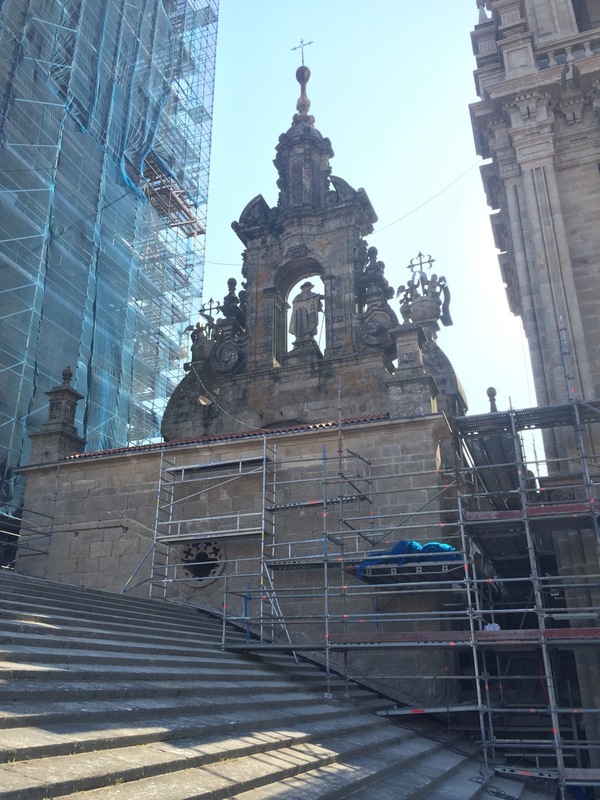 We also learned that the scaffolding on the west side (in the Praza de Obradoiro) is there because they’re cleaning and restoring it. 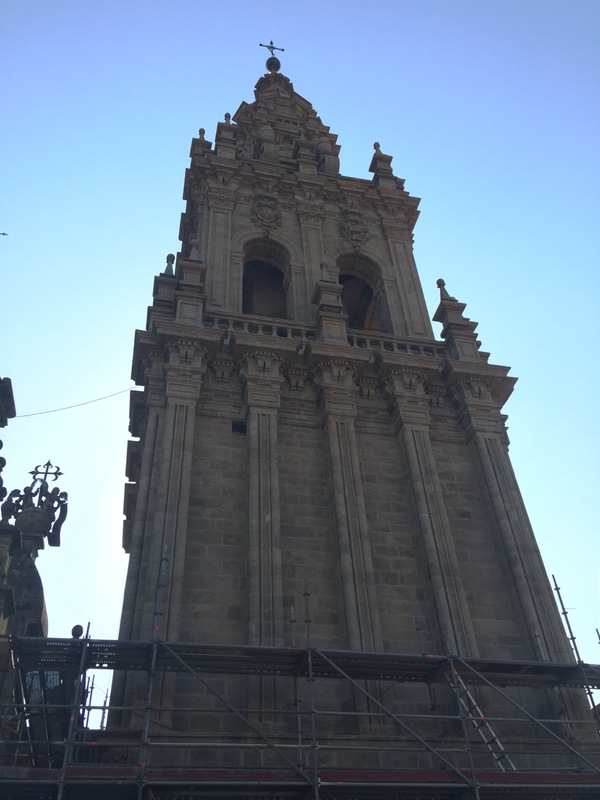 The bright, clean left tower was finished a few months ago and the right tower is due to be completed in two more months (approx. 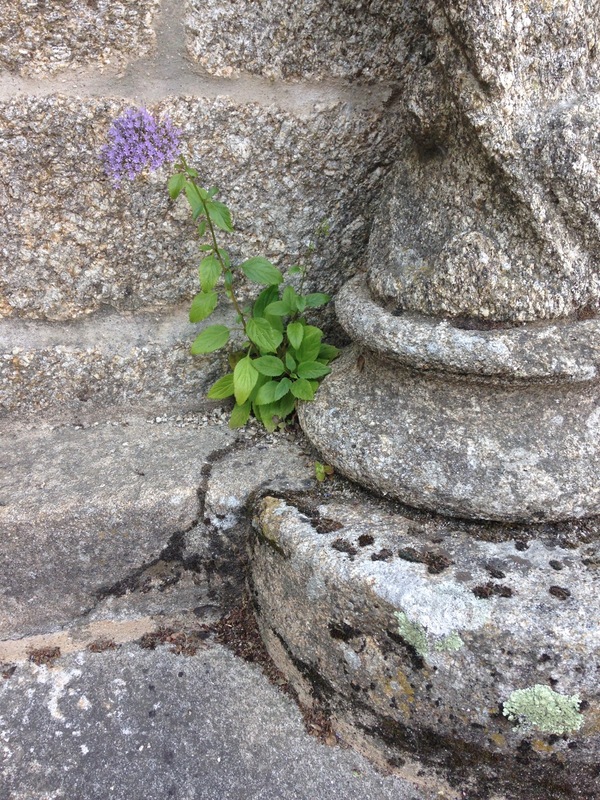 Aug. 2015). 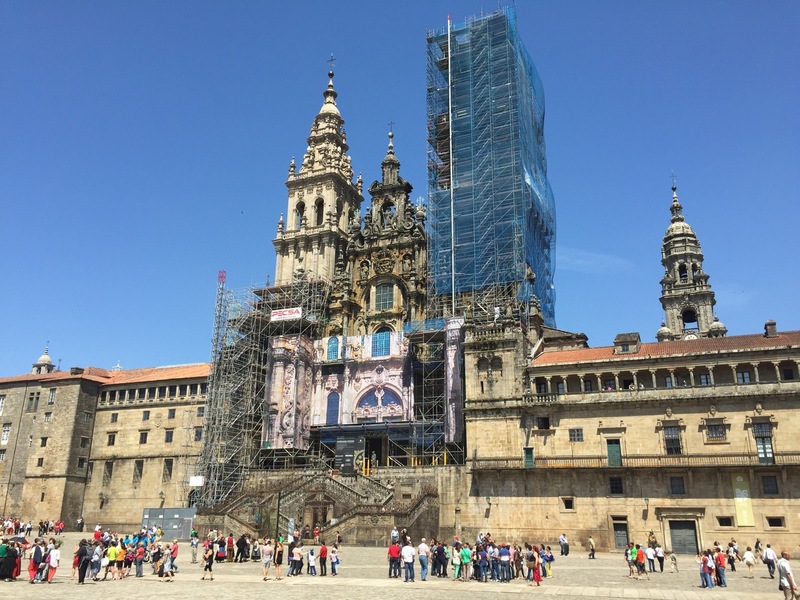 The center façade will take an additional year after that. 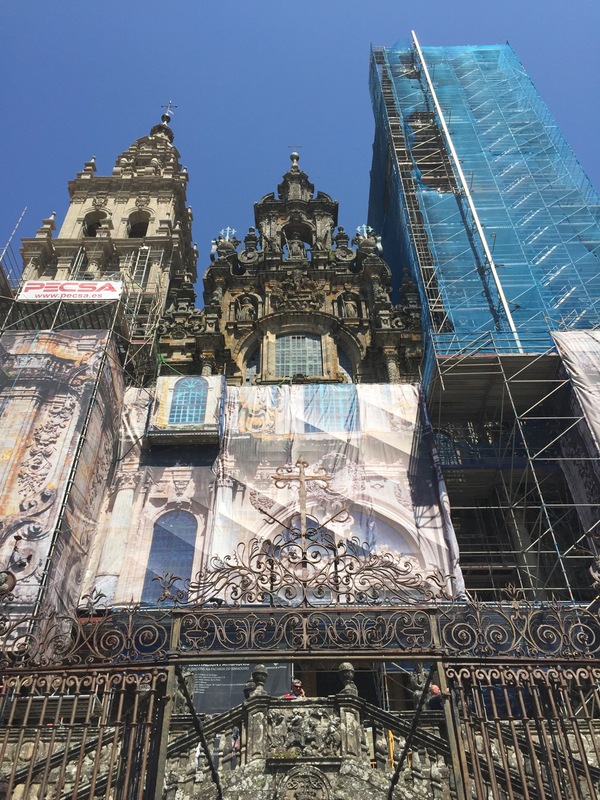 Also included in this cleaning and restoration process is the Pórtico de la Gloria, so the west entrance that pilgrims normally use is closed for the time being, and only the north and south doors are open. 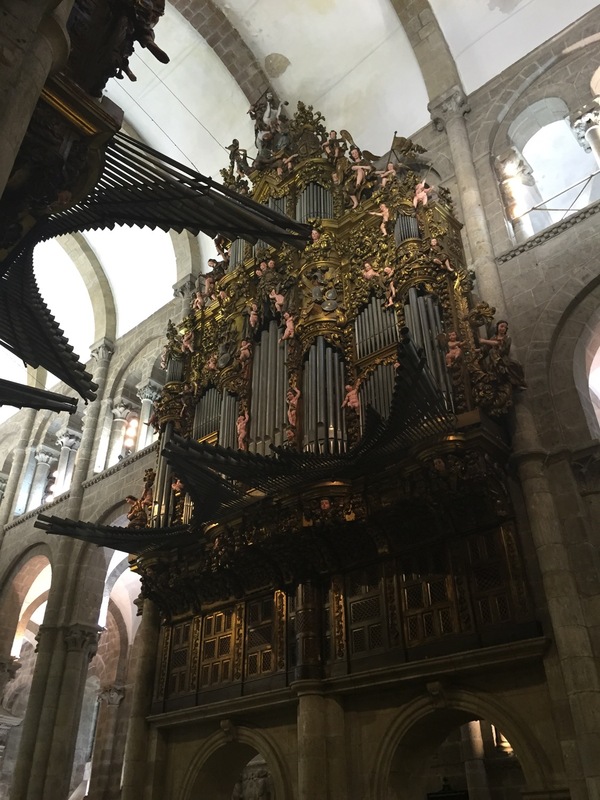 This unfortunately means that it’s currently not possible to see the Tree of Jesse (the marble column with five worn finger holes where pilgrims place their hand) and the sculpture of master architect Mateo, who masterminded much of the cathedral’s design. 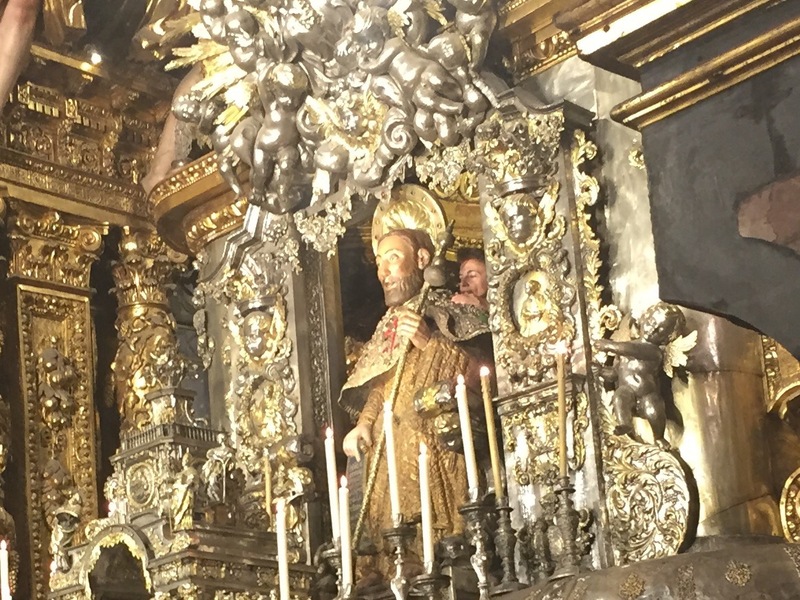 But if you go inside the cathedral to the far west end (opposite the main altar) and look past the temporary exhibit that’s blocking off the west portico, you can see the small statue of Mateo at the base of the center column — you just can’t do the tradition of touching foreheads with him, to supposedly gain some of his wisdom. 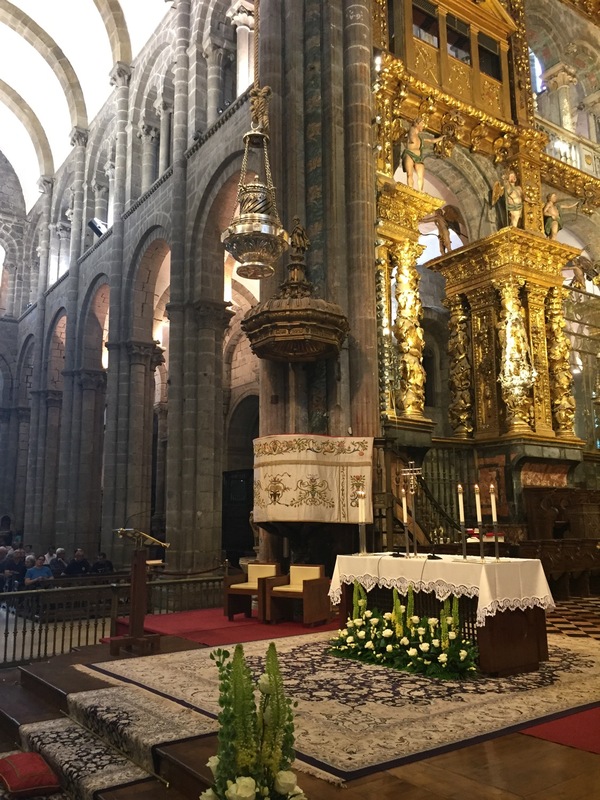 The Tree of Jesse is on the opposite side of that same column but can’t be seen right now (our tour guide said the tradition of placing your hand against it only dates back about a hundred years though, so it’s a fairly recent tradition). 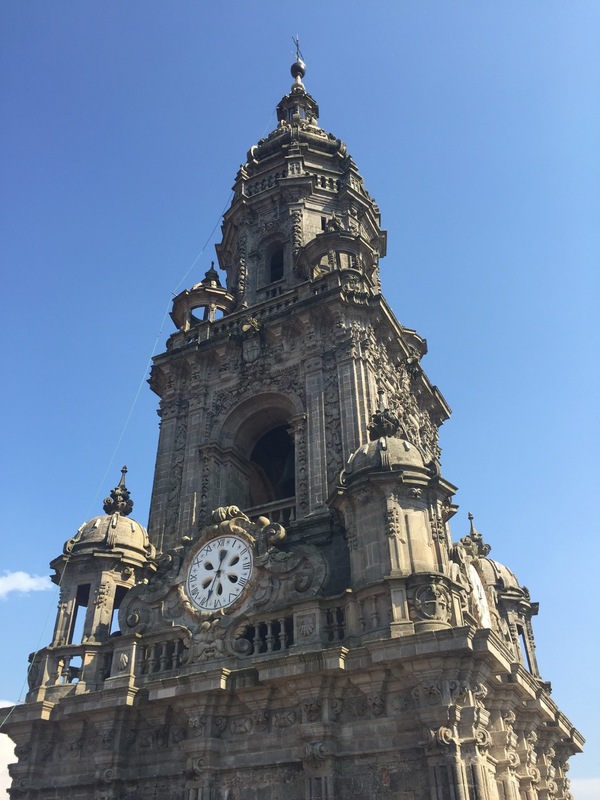 I specifically wanted to spend a couple of days in Santiago to just hang out and enjoy the experience before moving on. 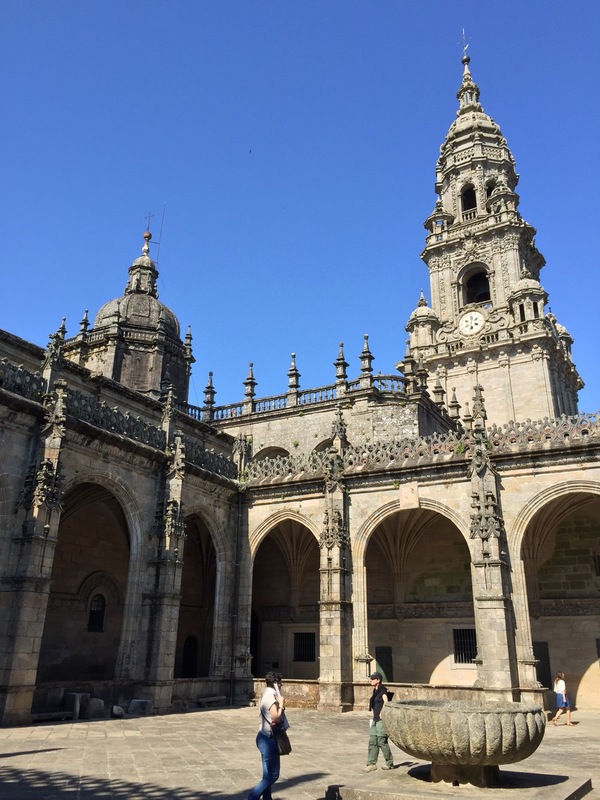 I spent some time just sitting in the main plaza as the pilgrims were arriving, and took pictures for anyone that wanted me to. 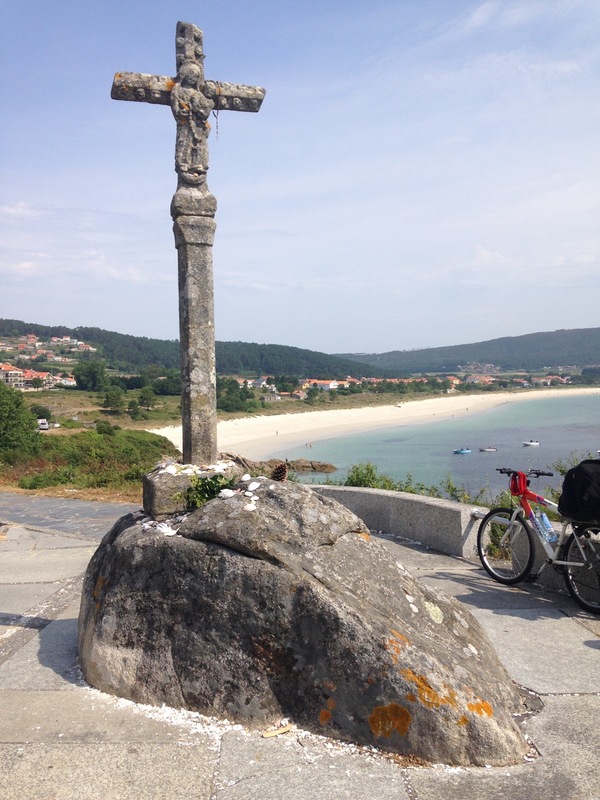 One woman from Argentina arrived alone by bike and was in tears as I took a photo for her. 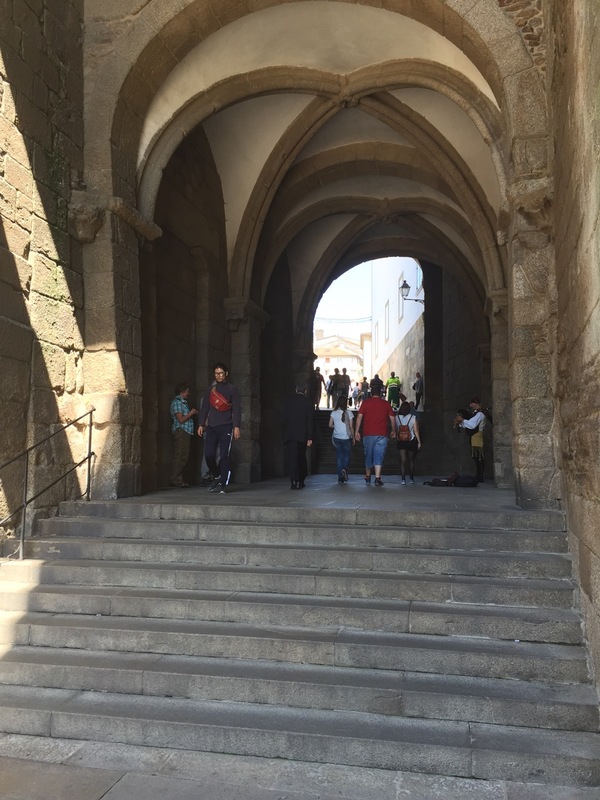 I saw an older couple walk about ten steps into the plaza, when the man suddenly dropped his walking stick, tossed down his backpack, and grabbed the woman he was with to hug her. 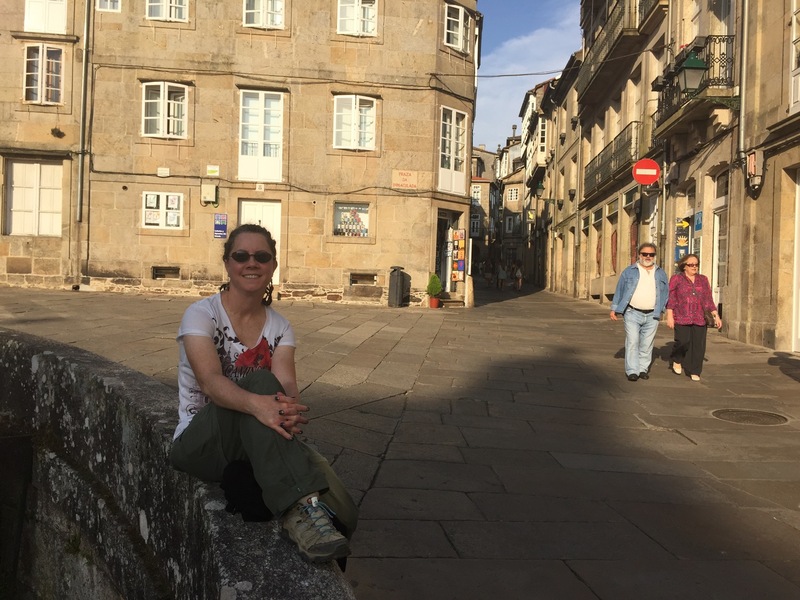 A woman from Brazil was with a woman from Switzerland, and they both proudly held up their Compostelas and their Credencials (Camino passports) as I took a photo for them. 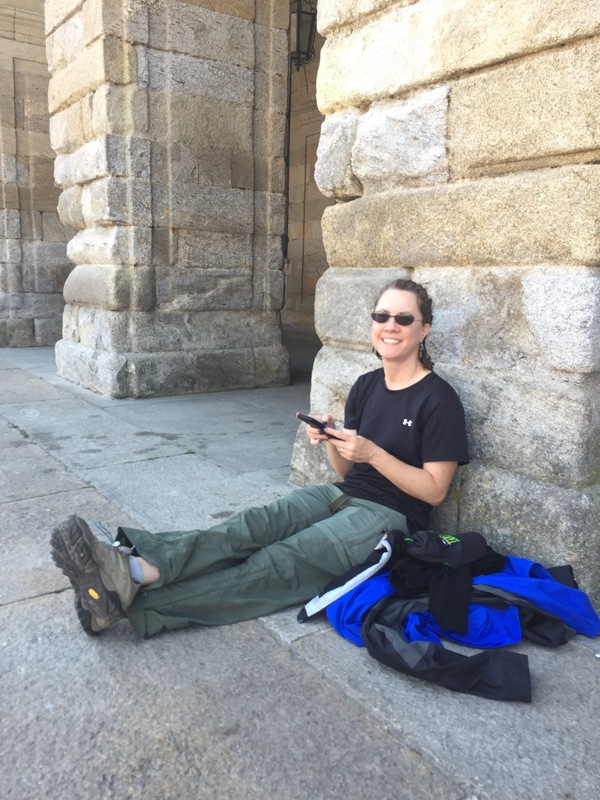 It was a great experience and I’m glad I took some extra time to just hang around there for a while. 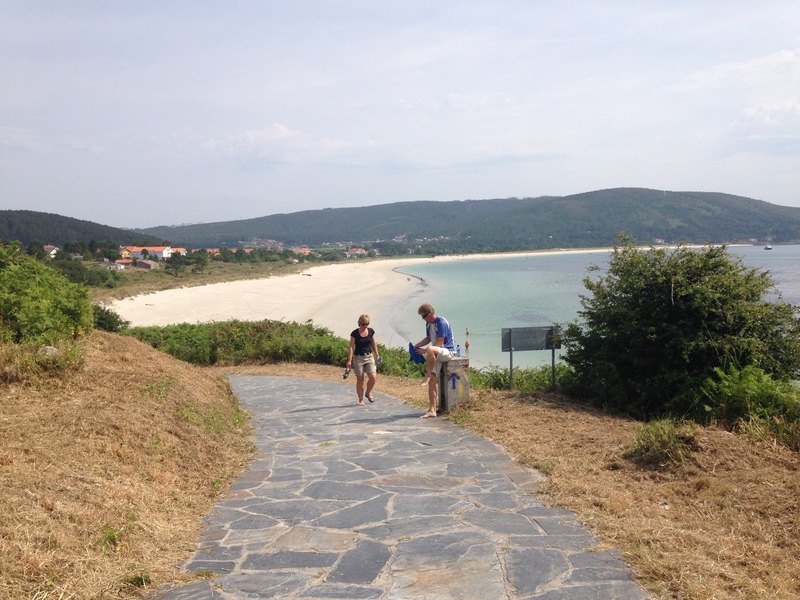 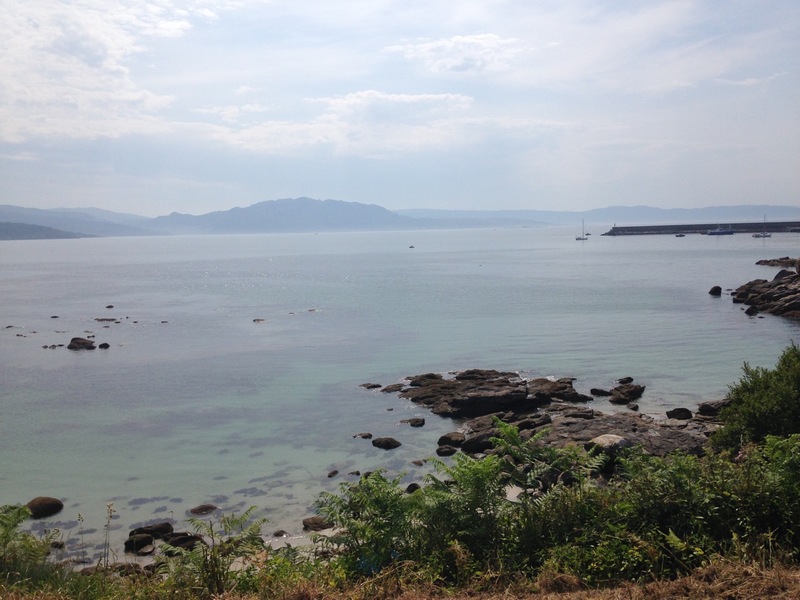 On Monday, Kathey and I rented a car and drove out to Finisterre to meet Ted and Lisa as they arrived. 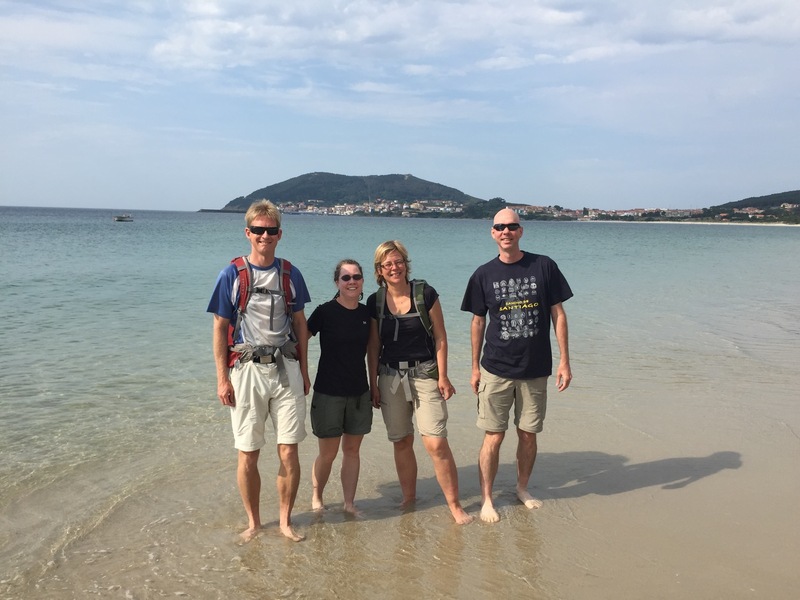 We just happened to spot them on the Camino path as they were about to walk down to the beach for the first time, so we all four walked out into the cold water of the Atlantic Ocean together. 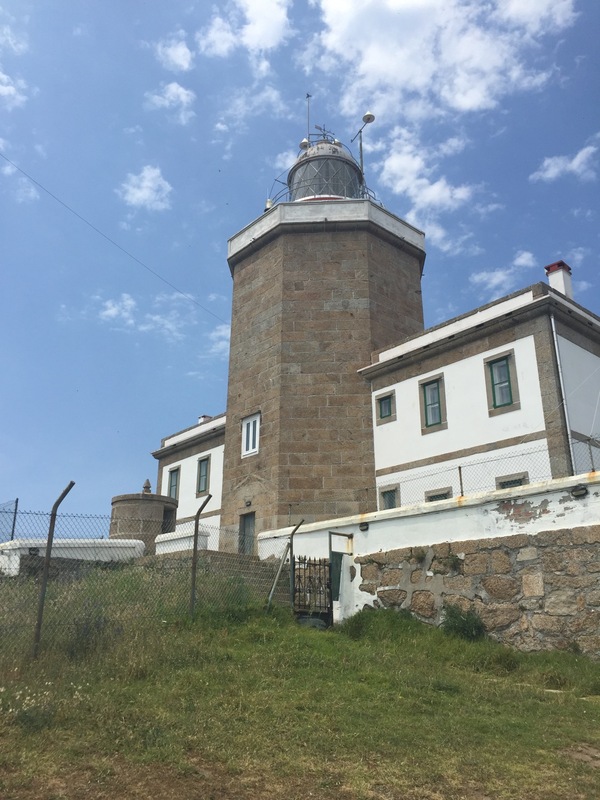 We also went up the hill to the lighthouse to see the zero kilometer marker (which indicates the end of the Santiago-Finisterre Camino, not the various Camino paths to Santiago) and look out over the ocean. 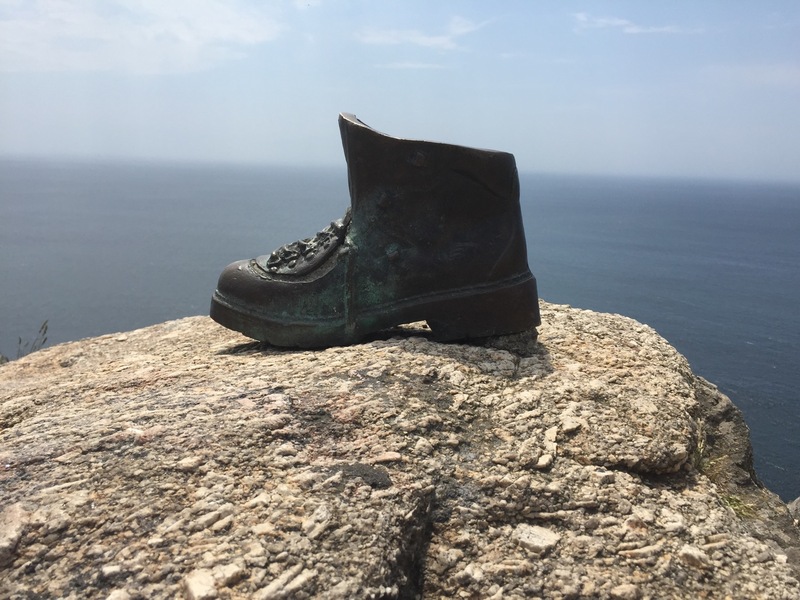 We could see several places where people had burned their clothes or boots, which has become a bit of a tradition there. 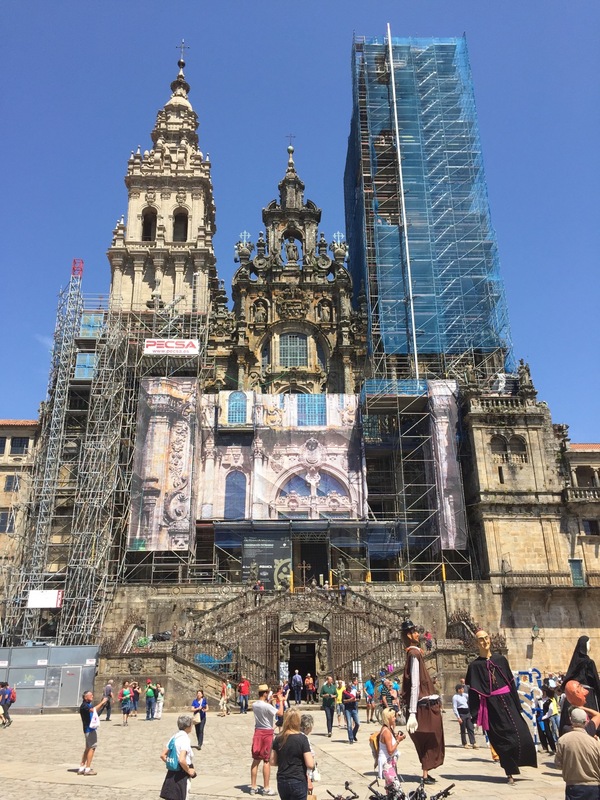 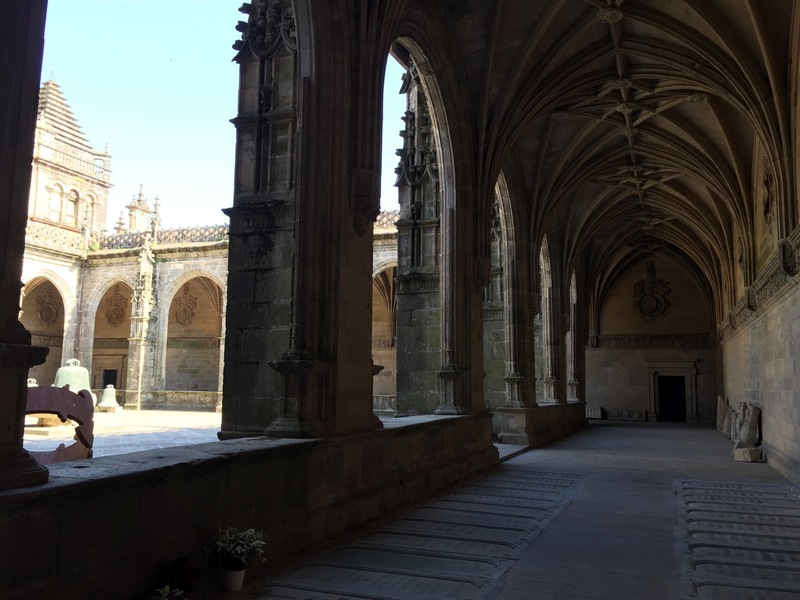 Here are various photos from the past few days in Santiago and Finisterre (for more, see Day 38: Amenal to Santiago de Compostela), starting with several from the west side of the cathedral where pilgrims gather, in the Praza do Obradoiro (Plaza of the [Stonemasons] Workshop). 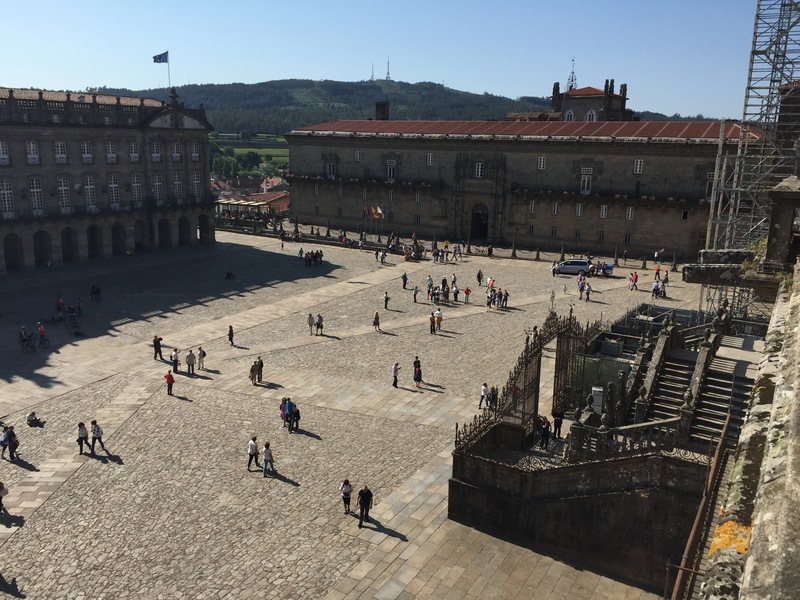 Two photos of the east plaza, which includes the Puerta del Pardón (Pardon Gate). 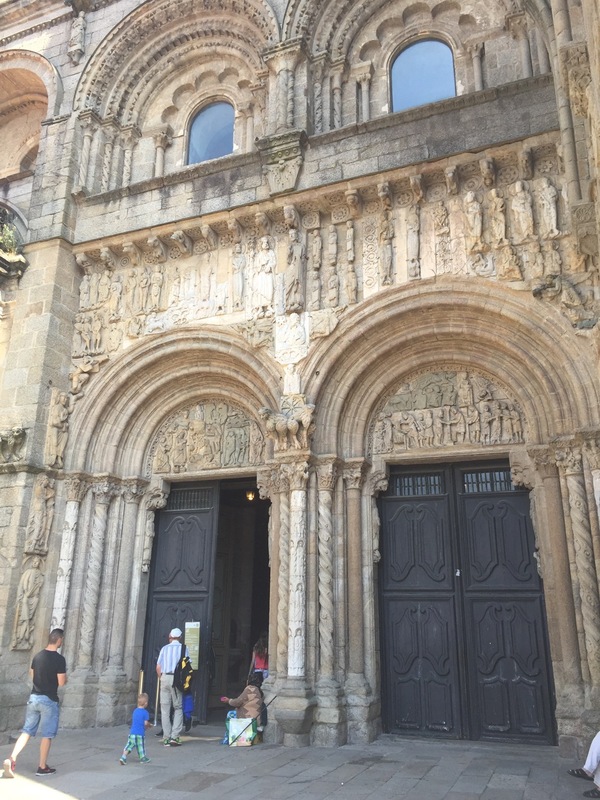 When this gate is open during Holy Years (when St. James Day of July 25th falls on a Sunday) pilgrims can enter and exit through it, receiving full indulgences instead of the partial indulgences received in normal years. 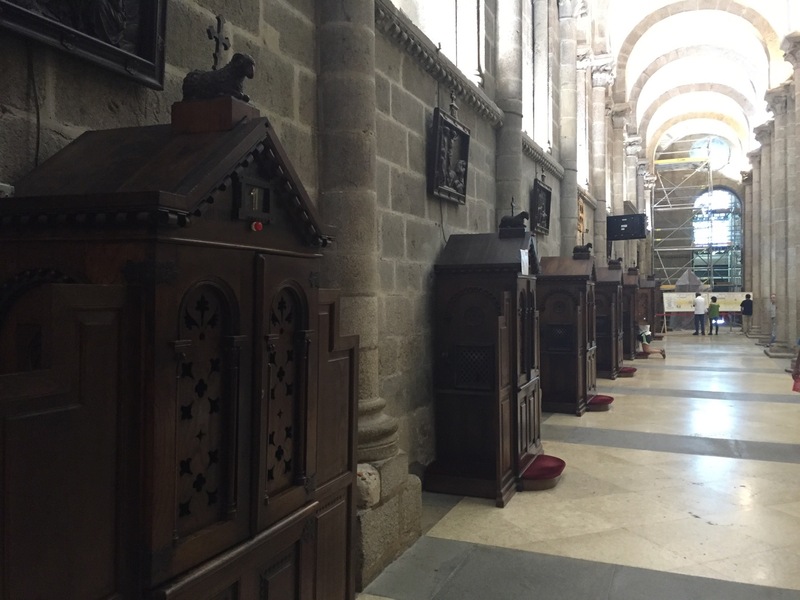 The next Holy Year will be 2021. 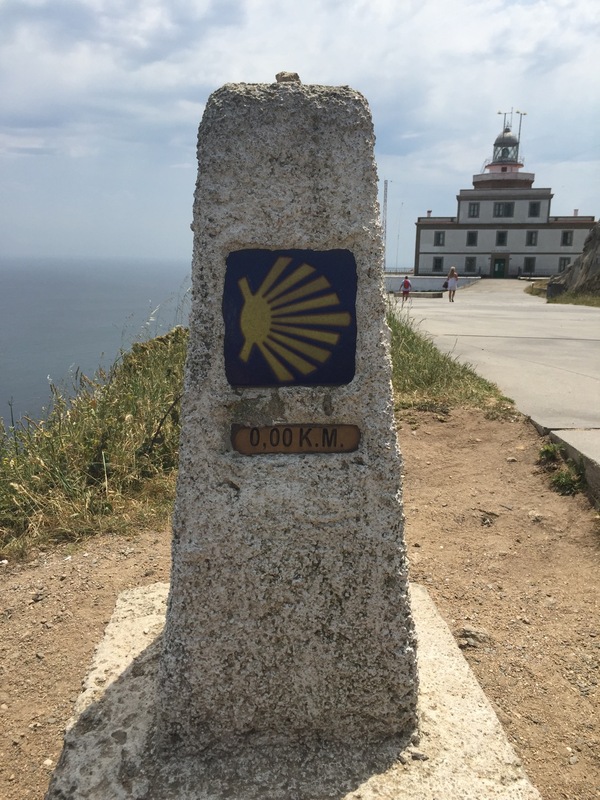 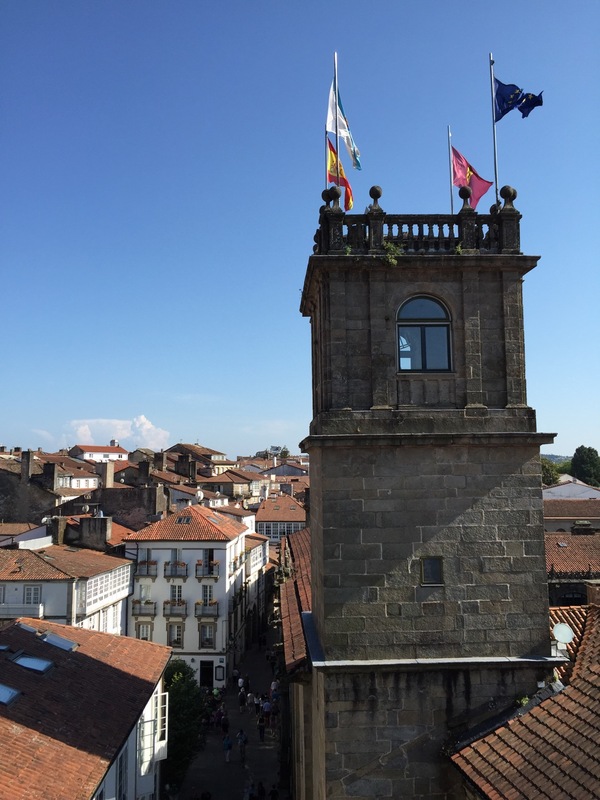 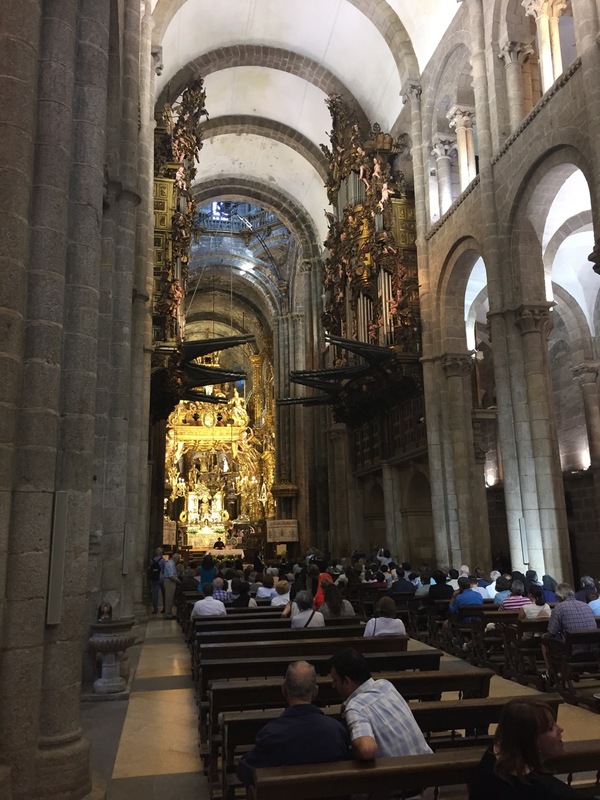 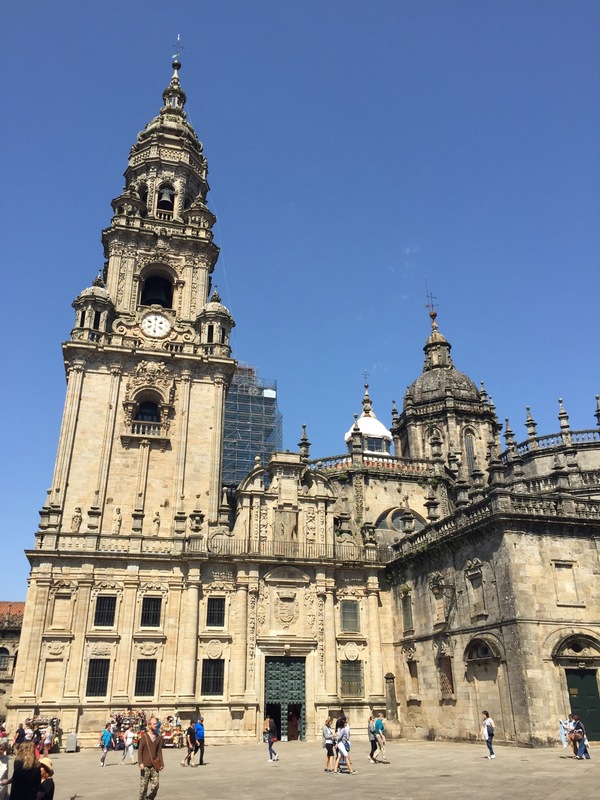 It turns out that the mother of a friend of mine completed the Camino on June 10. 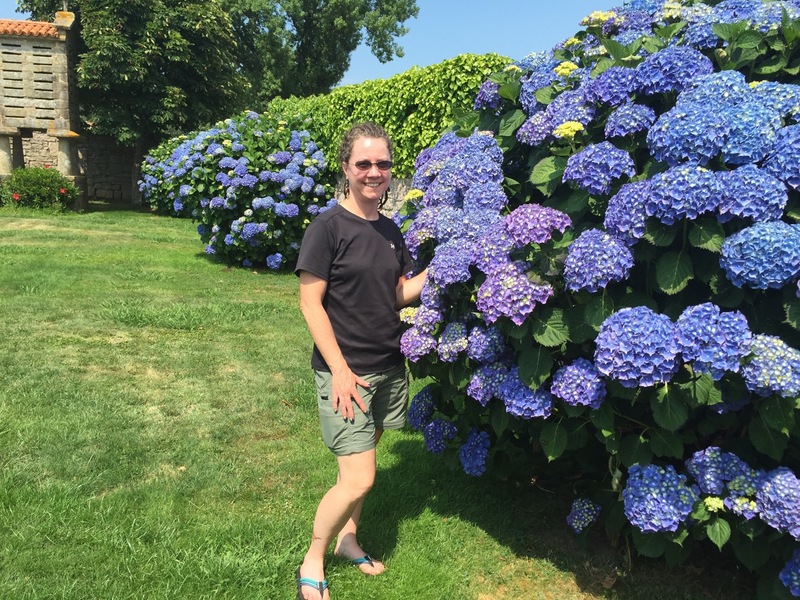 I did not know she was walking till my friend posted her completion photo – she did 500 miles from May 9 to June 10 to start retirement! 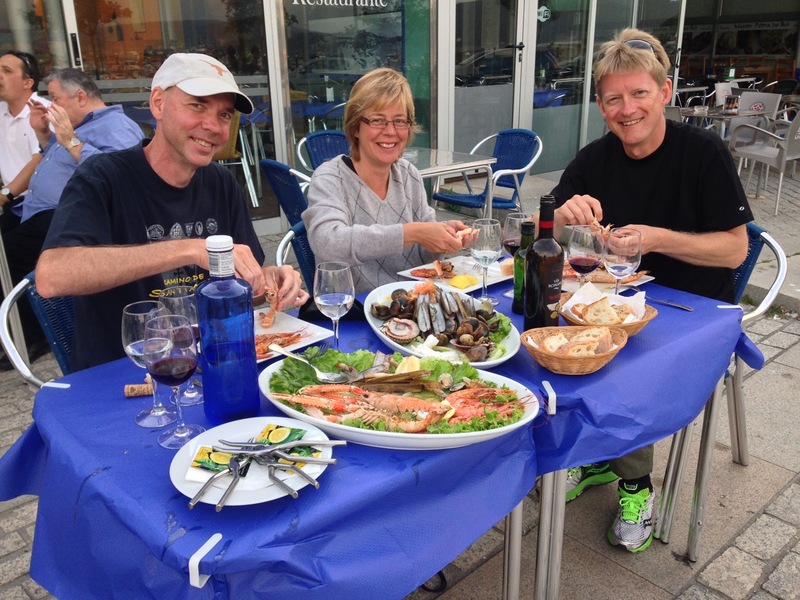 What a special memory that will be for you and those you photographed as they arrived! 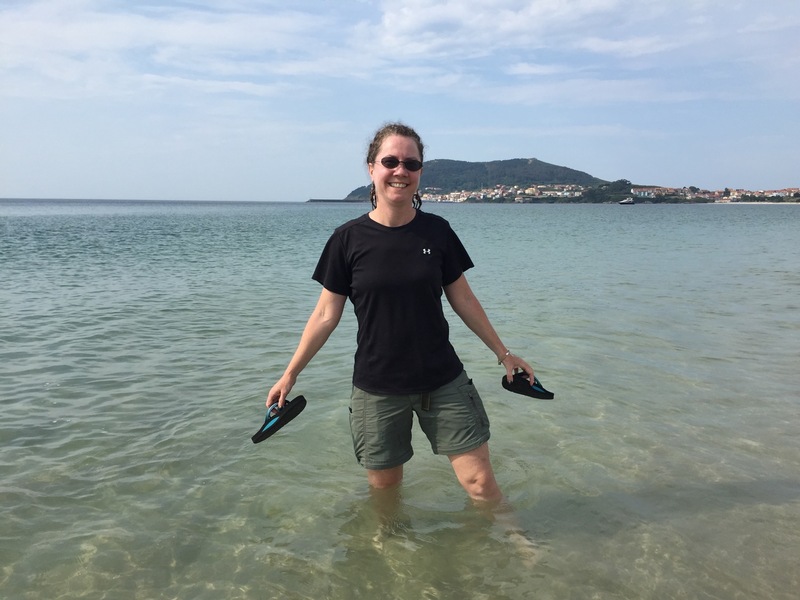 The smiles you are all wearing in those ocean shots are the best! 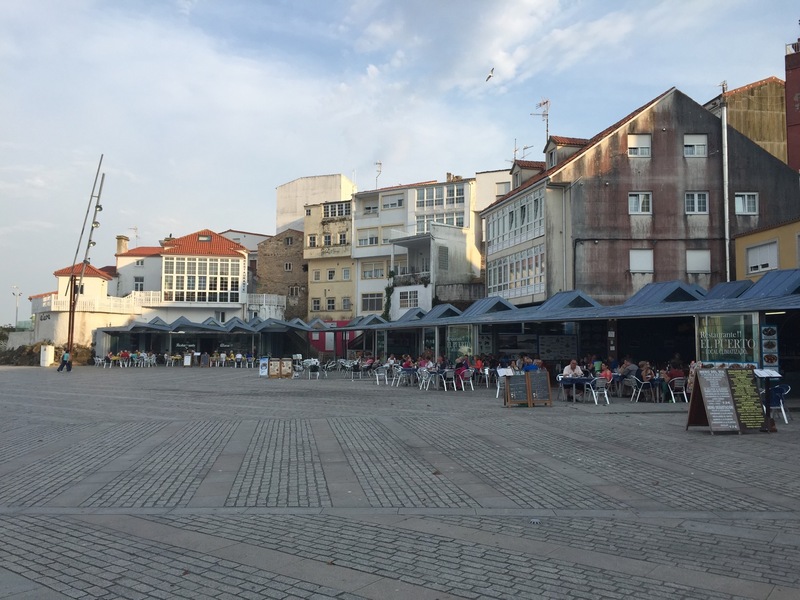 I’d love to have some port in Porto!